Greeted by Dražan’s bubbly wife, Karolina, and daughters Lana and Karla, we were handed shot glasses of walnut and cherry Rakija. Shawn and I soaked up the early afternoon sunshine, while mingling with Srđan, his friend Tino, and a group of guests from a popular wine bar in Split. Wood burning in the room’s handsome fireplace erased the chill from the winter air outside. 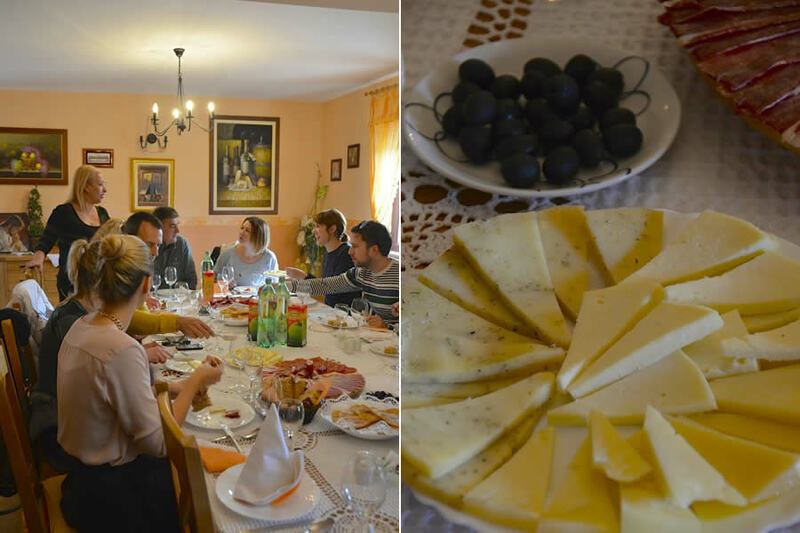 At the family’s dining table, we were offered plates of fresh cheese, Pršut (dry, cured ham), anchovies, black olives, hearty peka bread, and a gluten-free bread thoughtfully snuck in by Srđan. Made from milk taken from a cow just two days earlier, the cheese was probably the freshest I’ve ever tasted. It was extremely tender and delicately flavored with wild sage from the northern slopes of Mosor, where we’d hiked just weeks earlier. The other type of cheese was a slightly hard one, made with sheep’s milk that had been aged for one year. Had it not been for the wine tasting we’d be doing from the barrels in a few minutes, I could’ve easily sat there for at least another hour, slowly feasting upon the cheese. The cheese, like the pršut, were both made by the Krolo’s neighbors. In the neighboring building housing the fermentation room and wine cellar, we learned that the Krolo Winery produces about 15,000-20,000 bottles of wine each year. We would taste a Cabernet Rosé, Chardonnay, two vintages of Zinfandel, and a cuvée blend of Cabernet and Merlot grapes. 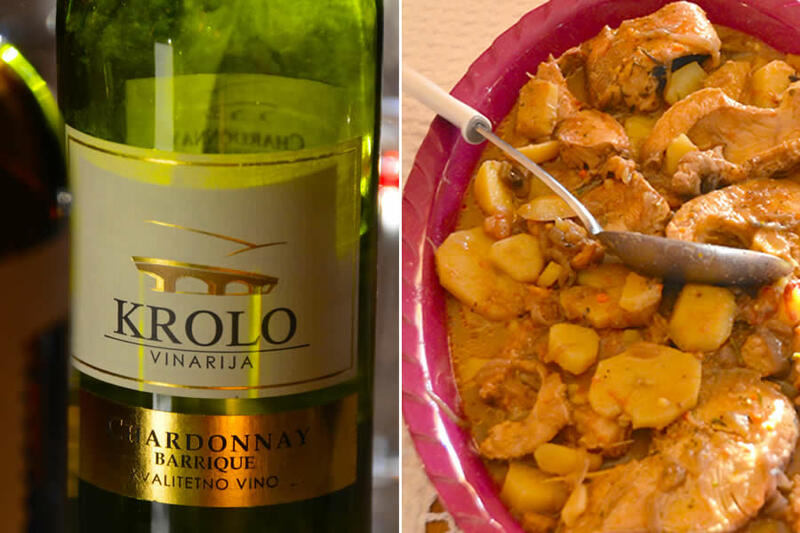 Through other guests acting as translators, we learned that the Krolo Winery’s climate is similar to that of Bordeaux’s. 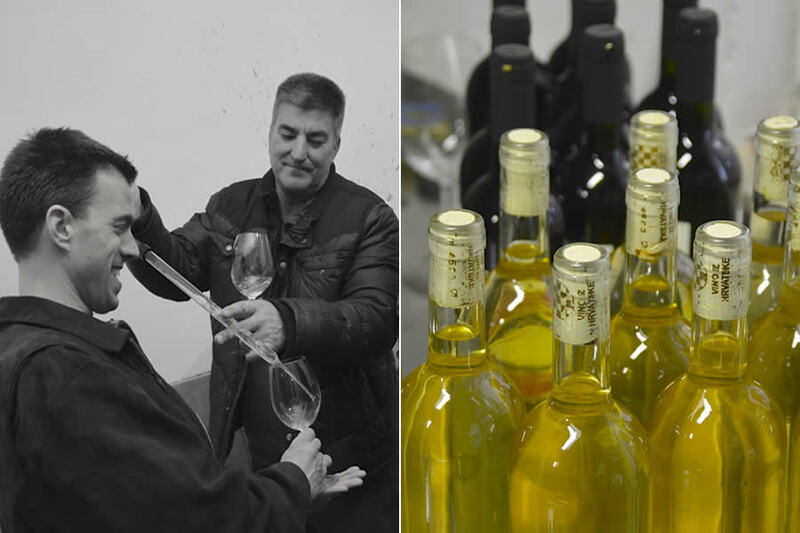 Winemaker Dražan also discussed the winemaking process and hazards that must be avoided in order to create a quality product. “Just like a child, wine is susceptible to illness,” he explained. Illnesses, he continued, could be detected by a winemaker regularly smelling and sampling the wine as it aged. In the worst-case scenarios, wine might start smelling like vinegar, or horse perspiration, sometimes due to types of yeast (known informally as Brett or Brettanomyces) growing in wine. 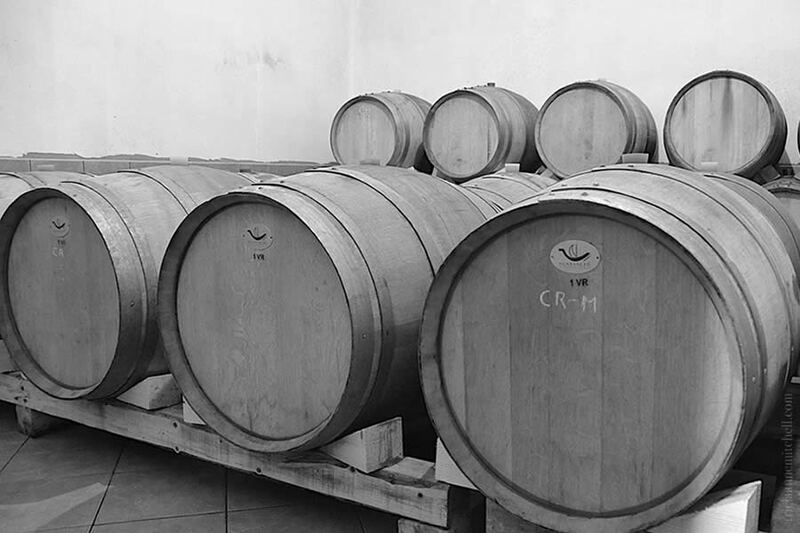 Dražan also mentioned that wine barrels must be stored with the grain of the wood in a vertical position and that he must regularly top off the barrel with more wine because a wine barrel absorbs the wine as it ages. 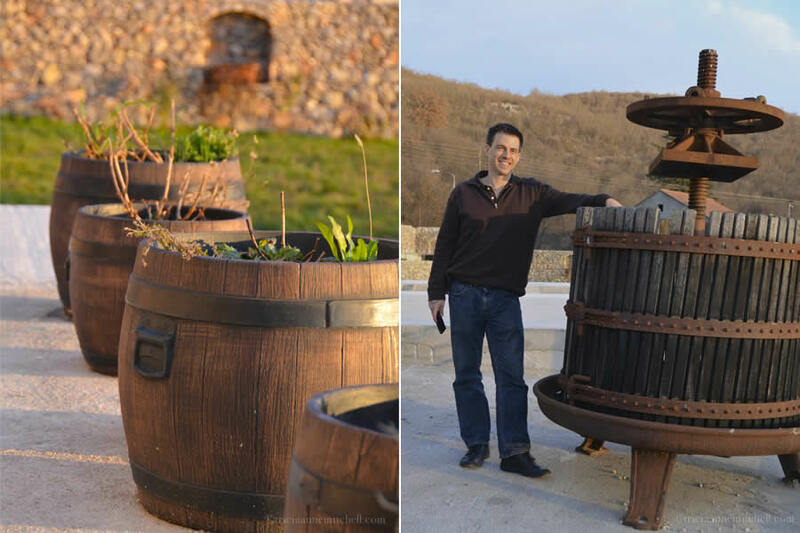 A modern-day Renaissance man, winemaker Dražan was professionally trained as an engineer. Having learned winemaking from his father seven years ago, he decided it was time to turn his passion for wine into a business, and the Krolo Winery was born. 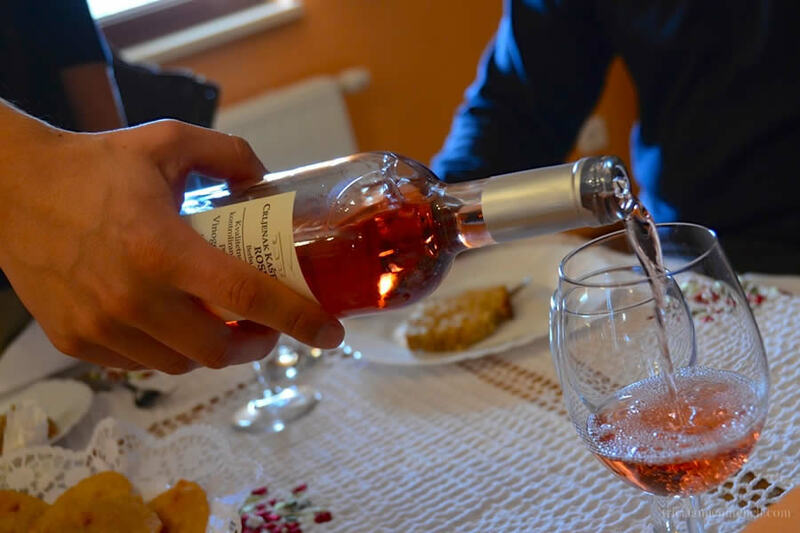 Inside the home’s dining room, we’d return to bottles of Zinfandel Rosé, Chardonnay and a blend of Dingač and Babić grapes. After warming up with a tasty, steaming soup, we would soon be feasting on delightful helpings of Fish Stew (Brodet) and Beef Pašticada. As we savored our dishes, Karolina discussed her philosophy on life, and what has made their various entrepreneurial pursuits successful. Having learned that the Krolos had extensively travelled throughout the world, I asked Karolina what her favorite destination had been. “Perth, Australia came close to being as beautiful as my home of Split,” she said, with a smile. 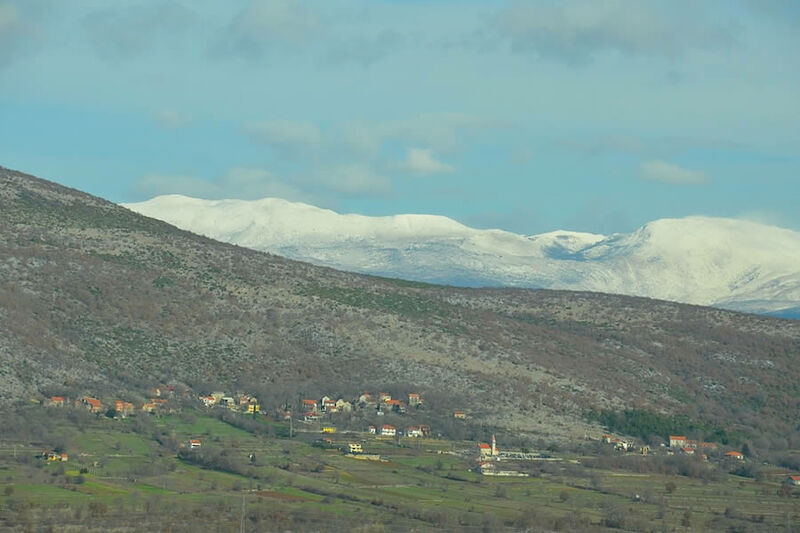 With dramatic scenery and a bounty of delicious food options in the Split region, it was perhaps not surprising that Karolina had chosen to live here. We had read that Split residents are fiercely proud of their seaside home, and Karolina’s response epitomized this sense of satisfaction. The golden hour gradually acquiesced, giving way to a sky bedecked in twinkling stars. Our hosts continued to stuff our bellies with goodness, ending with dessert, robust Turkish-style coffee, and finally, warm goodbyes. As the star-lit sky in the countryside transitioned to one illuminated by the lights of Croatia’s second largest city, and our temporary home away from home, we reminisced on what a wonderful afternoon it had been getting to know more about a slower pace of life in Croatia’s Dalmatian hinterland. Karolina’s cooking epitomizes the Slow Food movement, which aims to preserve local food traditions and raise awareness of the food people eat. In today’s fast-paced world, do you think this is do-able? If so, how do you incorporate such practices into your lifestyle? As they say in Croatia, Dobar tek – bon appétit! Krolo 2011 Zinfandel Rosé (Crljenak Kaštelanski), with 12.1% alcohol content. Label-less Dingač and Babić (made by a wine-making friend of the Krolo family). Soup: Fish, Cabbage and Carrot (Tricia) & Beef, Carrot and Dumpling (Shawn). Dessert: Gluten-free cookies (Tricia) & Chocolate Mousse Cake (Shawn) accompanied by Turkish-Style Coffee. The drive from Split to the Krolo Winery is beautiful. Snow-capped mountains peek over rolling green hills. 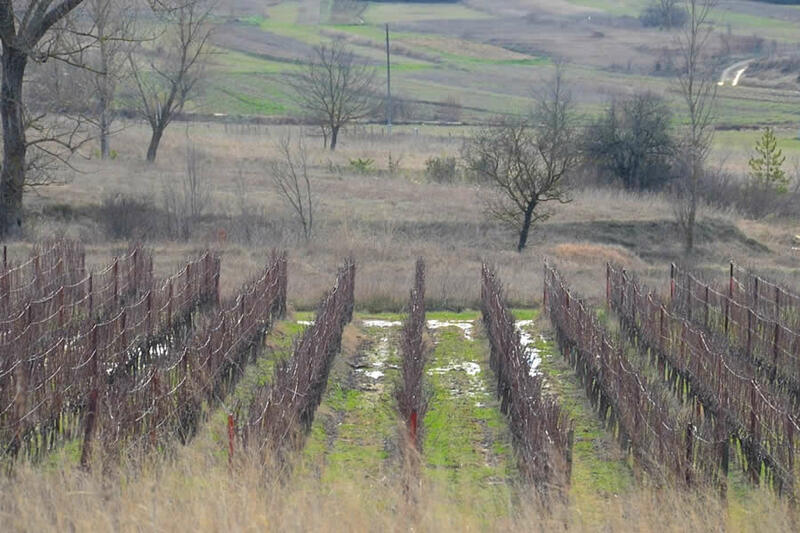 The Krolo Winery’s vineyard. At this point on the map, Croatia’s continental climate meets its Mediterranean one. 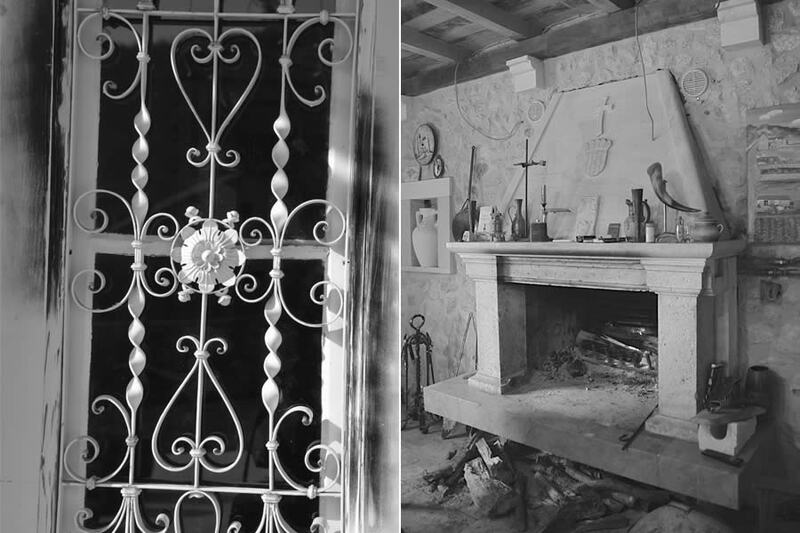 An intricate iron door salvaged from a demolished building greets visitors to the Krolo Winery. On the right, stone walls and a handsome fireplace adorn the home’s entryway. 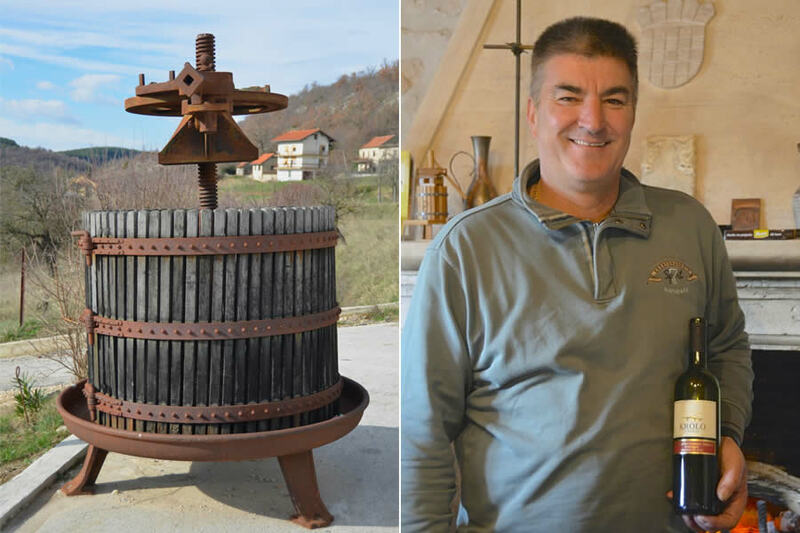 A vintage winepress sits at the ready by the entrance to the Krolo home, and winemaker Dražan proudly shows off his bottle of Cabernet Sauvignon-Merlot. 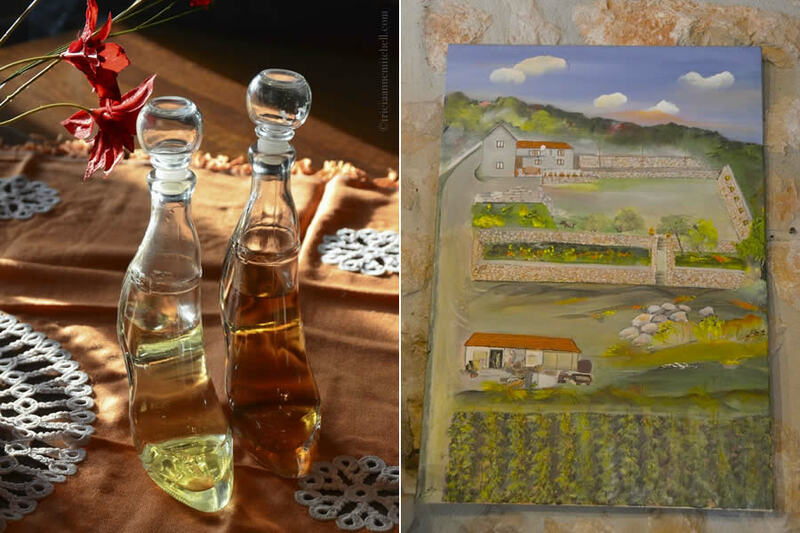 Whimsical bottles shaped like ladies’ shoes hold the Krolo’s homemade Rakija, which is Croatia’s version of Grappa or brandy. We were treated to walnut (orah) and cherry versions (víšnja). On the right, an artist’s interpretation of the Krolo’s country home and grounds. Dražan and Karolina’s daughter, Lana, unveils two wooden boards teeming with homemade gnocchi, known in Croatia as njoki. Though they are most often associated with Italian cuisine, gnocchi (or Croatian, njoki) are a popular soft pasta dish in Croatia’s Dalmatia region. 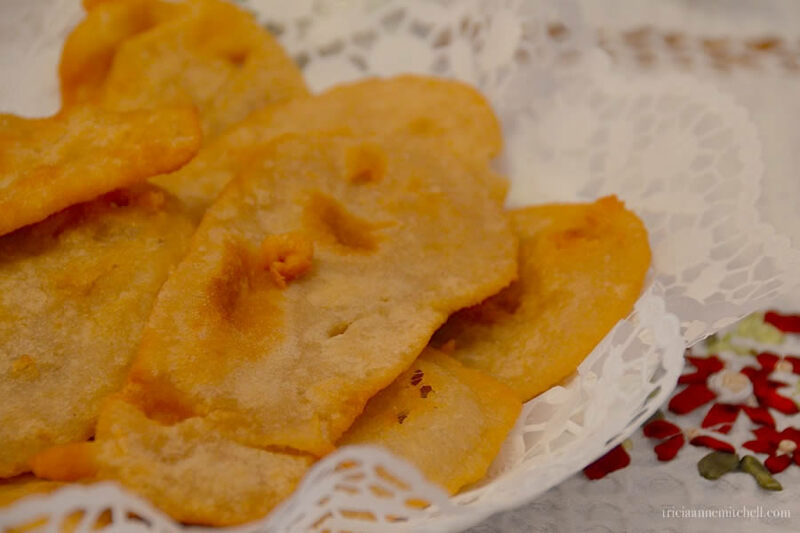 The Krolo’s version was made with potatoes and wheat flour. They would later accompany Pašticada, Croatia’s beloved version of a stewed beef dish. 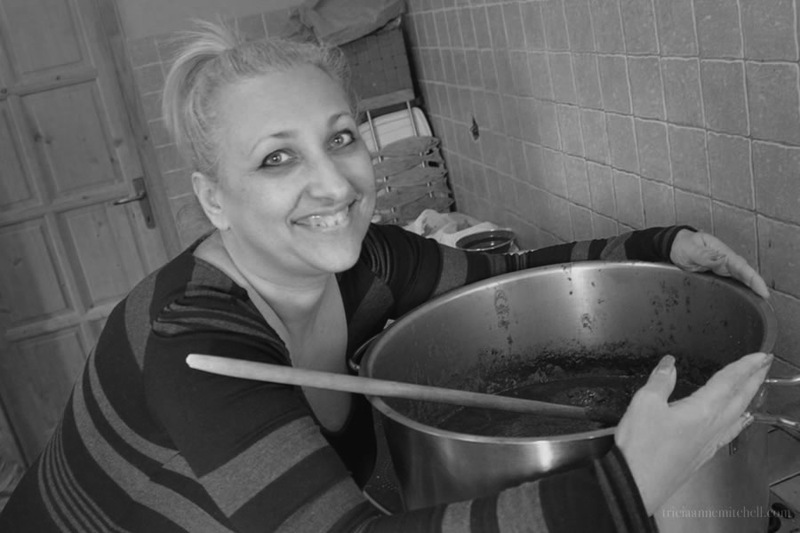 Ever playful, Karolina carefully guards the pot of Pašticada, which was made with 4 kg. of vegetables and 2 kg. of prunes. Though some Croatian cooks marinade their Pašticada for a longer period of time, Karolina prefers to marinate hers for only four hours to avoid an acidic taste. Karolina (standing) chats with other guests in the family’s dining room. On the table, the freshest of cheese awaits, as do black olives, pršut, and anchovies. Uštipci, a savory fried bread. 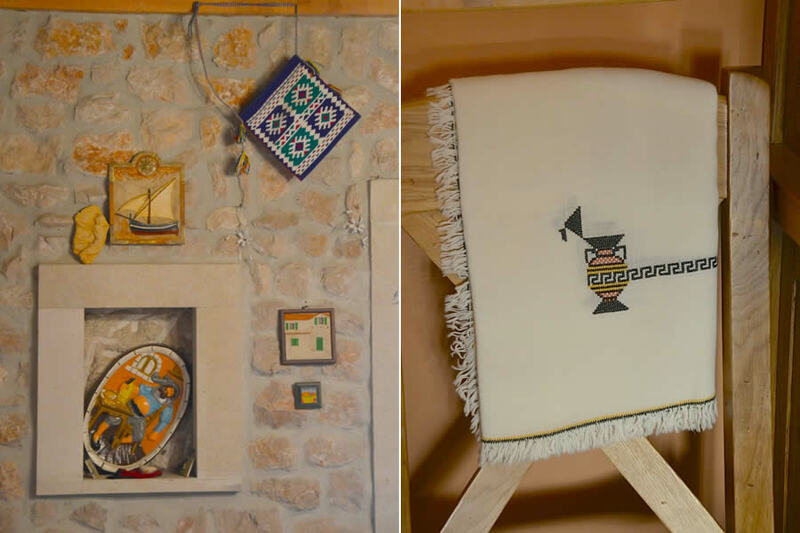 Folk-art crafts embellish the stone walls of the family’s living room and a chair. 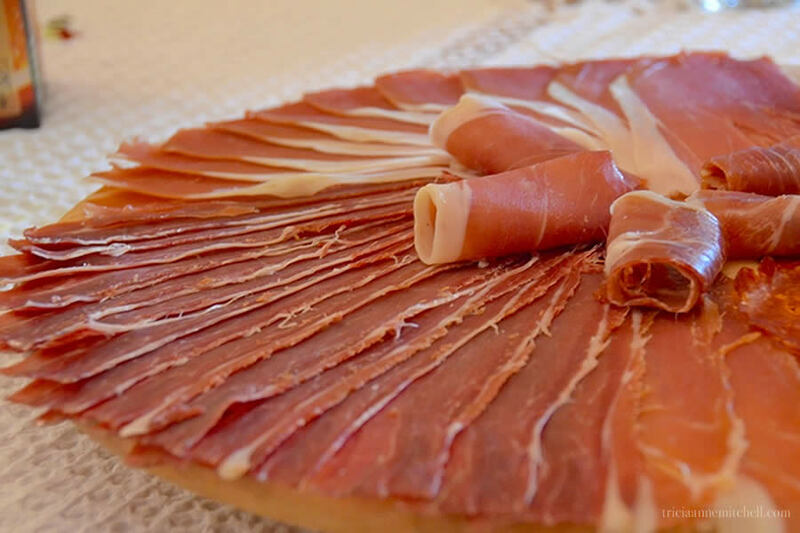 A plate of Pršut (dry, cured ham) which is similar to Italian Prosciutto. Like the glorious cheese accompanying it, the pršut was made by the Krolo family’s neighbors. Starting with a delightful 2011 Krolo Zinfandel Rosé (Crljenak Kaštelanski). 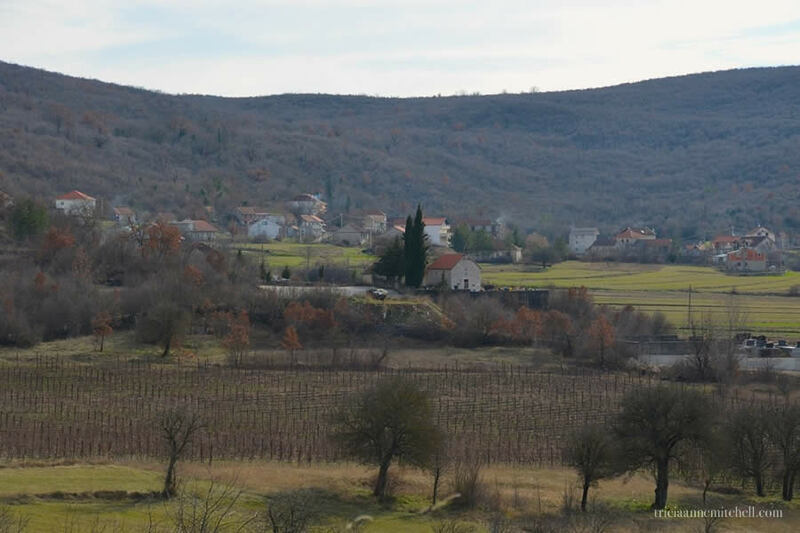 The Zinfandel grape has been grown in Croatia’s Dalmatia region for more than one thousand years; Dalmatia is considered to be the grape’s ancestral home. 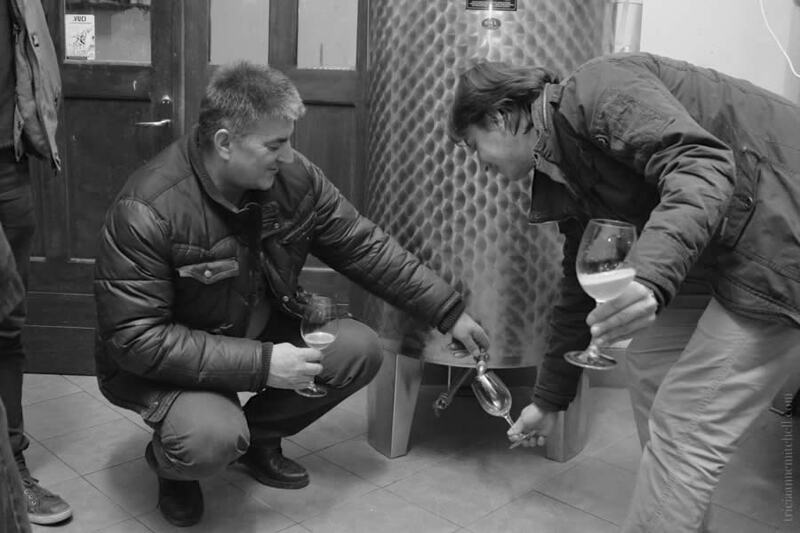 Dražan pours glasses of wine directly out of the steel fermentation tanks for our friend, Srđan. A section of the Krolo Winery Cellar. 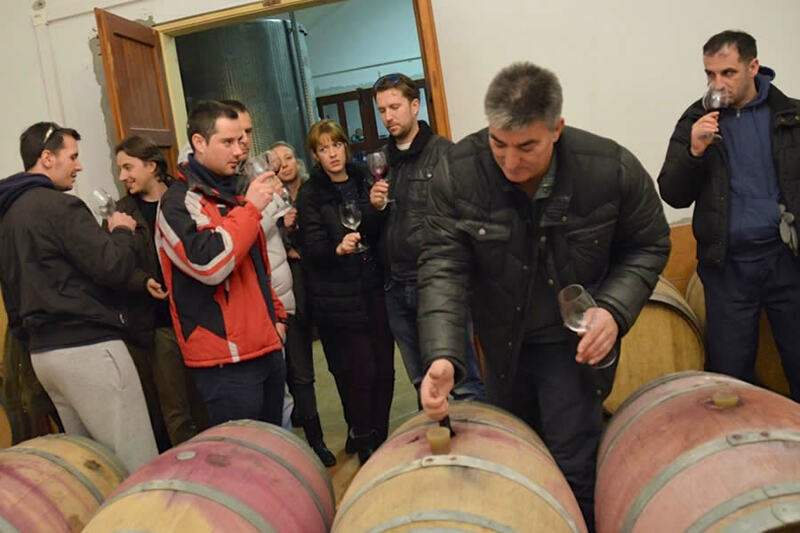 Winemaker Dražan uses French and Croatian oak barrels. Dražan siphons Chardonnay out of a barrel for Shawn to taste using a glass tool called a wine thief. On the right, wine bottles await labels in a back room. 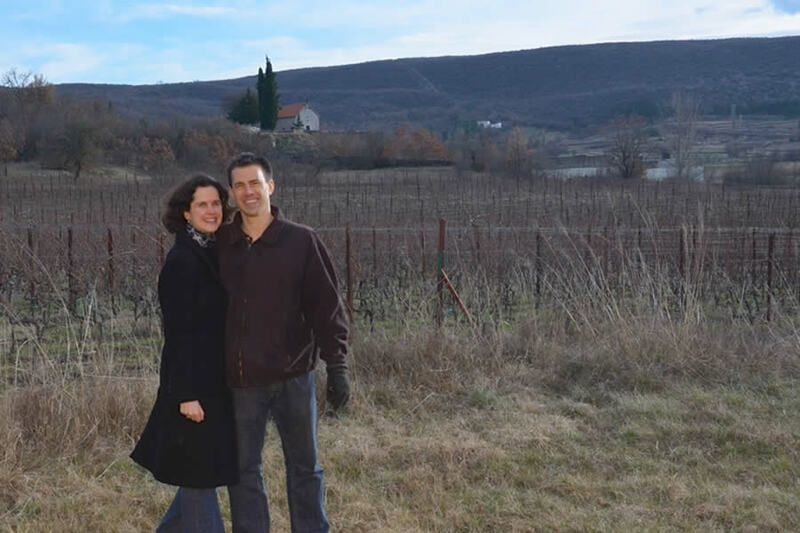 Shawn and I enjoy a carefree moment in the vineyards following the tasting in the nearby cellar. 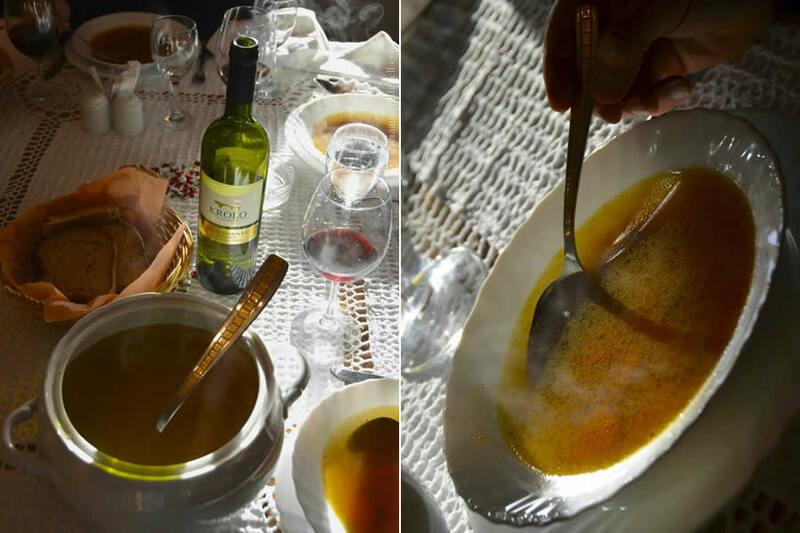 After our chilly walk through the grounds of the Krolo Winery, Karolina’s hearty soup was especially satisfying. Shawn enjoyed a bowl with beef, carrots and dumplings, whereas my gluten-free version was made with fish, cabbage and carrots. The much-awaited culinary attraction Beef Pašticada (Croatian beef stew) makes its arrival to the lunch table. On the right, Dražan pours a glass of wine made by a friend. It was a blend of Dingač and Babić. A dish as prized as Pašticada creates competition among the diners. 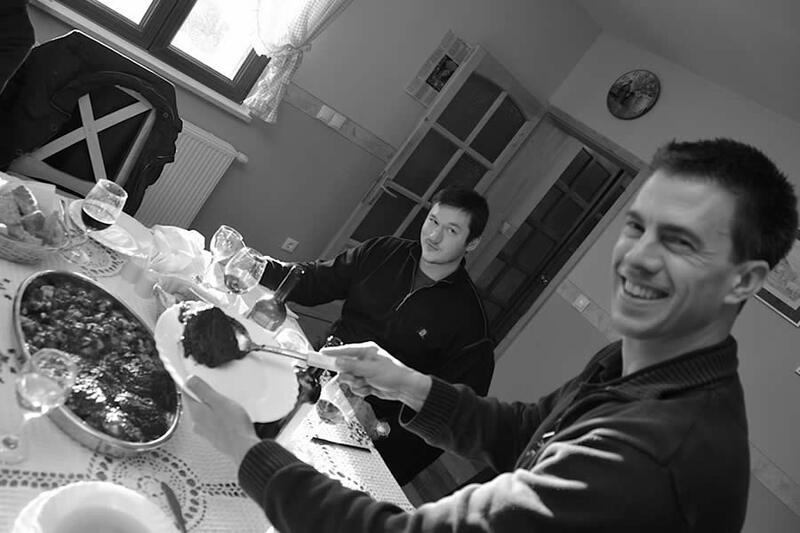 :) Here, Srđan’s friend Tino looks as though he is mischievously guarding the stewed beef dish as Shawn serves up a generous scoop. The Krolo Family incorporated the golden silhouette of a famous nearby bridge into their label’s design. The bridge, which is in the village of Trilj, not far from the family winery, was once the boundary between the Roman Empire and territory held by Illyrian tribes. The area served as a base for legionnaires of the Eastern Roman Empire. On the right is a platter of Brodet – Croatian Fish Stew. Karolina made this for me, knowing that I’m a selectarian meat eater that couldn’t eat the Beef Pašticada. My stew was made with Red Scorpionfish (Škarpina), Pike (Štuka), and potatoes and peppers sautéed in wine and chicken stock. 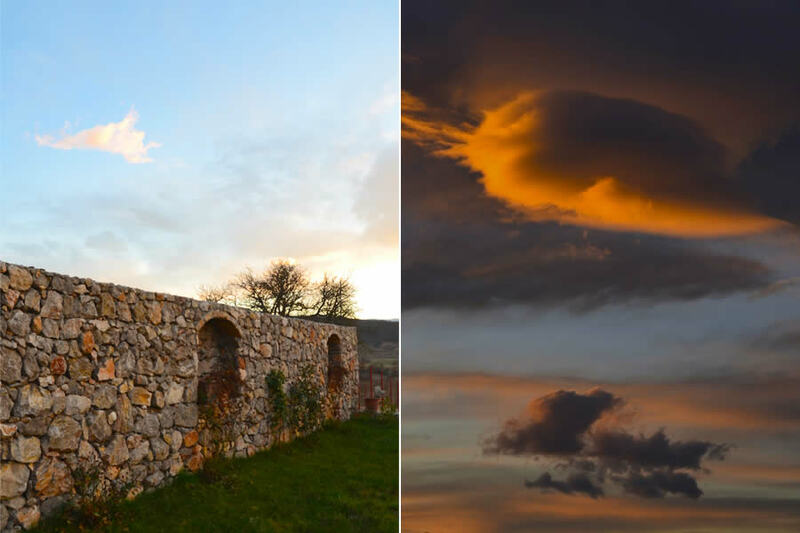 Even when it’s slumbering during the winter months, Croatia’s Dalmatia region looks lovely. Here one can imagine the colorful flowers that must overflow from these whisky barrels and flower-boxes in the warmer months! After lunch, half of our group went on an adventurous ride through the grounds in the Krolo’s vineyard vehicle. We decided to stroll the countryside instead, but felt like sticks-in-the-mud when we learned how fun the ride was. Apparently the vehicle got stuck in the mud and the riders had to muster up enough strength to get it moving again. On the right, Tino and Srđan share a laugh before returning inside for dessert and Turkish Coffee. The golden hour descends on the Krolo estate, with a shrimp-colored sunset later serving as the finale to a lovely day replete with good conversation, Croatian food and wine. Cut shoulder into 2 to 3 large pieces. In a pot or sealed bag, combine water, vinegar and beef. Let marinade for 24 hours. Remove beef from marinade. Pat dry. Season with salt and pepper on all sides. Using a large pot, heat oil over medium-high heat. Once oil begins to shimmer, sear all sides of the beef. Sear beef one by one if your pot is not big enough. Don’t crowd the pot, or the beef will boil instead of sear. Remove beef from pot after seared. Add onions, garlic and celery. Cook for 5 minutes while stirring to pick up the bits at the bottom of the pan. Add carrots, prunes, and bay leaves. Cook until vegetables begin to soften, about 10 minutes. Add meat to the pot. Add water or beef stock until it reaches ½ way up the meat. Cover and cook on low heat for 1 hour. Remove lid, and continue coking on low until liquid has reduced by half. Add wine and prošek. Let cook on low uncovered until liquid has reduced by half again. Remove beef from pot. Slice beef into ½” (13 mm.) slices, cutting against the grain. Puree sauce using a blender, food mill, or food processor. Add sauce and beef back to the pot. Simmer on low for another 20-30 minutes. If sauce is too thick, add a little water to thin it out. Boil potatoes until very tender in salted water. Mash potatoes until no lumps remain. User a hand mixer to whip potatoes, if necessary. Turn potatoes out onto a floured surfaced. While potatoes are still warm, knead in the egg and the butter. Alternating between the pastry and all purpose flour, knead in a heavy sprinkling of the flour into the potatoes. Continue to add sprinklings of flour and kneading the potatoes, until it becomes a dough. The dough will be ready when it’s no longer sticky to the touch or sticks to your counter. Once dough is ready, take a fistful of dough at a time and roll it out into a log that is about 1” (25 mm.) in diameter on a floured surface. Using a paring knife, cut the rope into 1 – 1 ½” (25 mm. – 40 mm.) gnocchis. Set cut gnocchis off to the side and sprinkle with pastry flour to prevent sticking. Continue with remainder of dough. 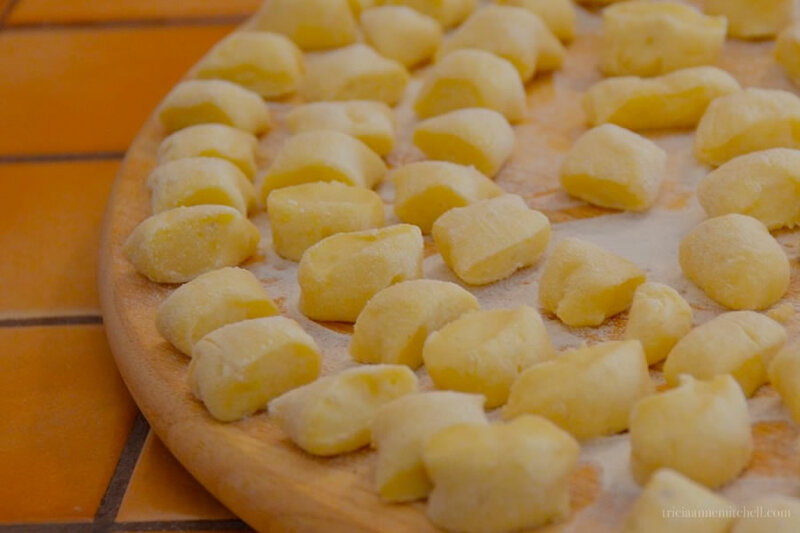 If not cooking gnocchi immediately, layer the gnocchi on a parchment lined cookie sheet that has been sprinkled heavily with flour. Don’t let them crowd each other. Continue adding another layer of parchment, more flour then more gnocchi. Wrap the tray in plastic and freeze overnight. Once frozen, the gnocchi can be moved to a zip top bag. If cooking gnocchi immediately, boil a pot of water. Add a pinch of salt. Throw in a couple handfuls of gnocchi. Once the gnocchi is in, give it a gentle stir so that they don’t stick to the bottom or each other. Don’t crowd the pot. Boil the gnocchi until they float to the surface. Remove cooked gnocchi and add to a reserved pot of Pašticada sauce. Serve. Shawn and I have spent two winters in Split, finding accommodation in apartments that would be packed during the summer months, but are practically empty during winter. During our first 2.5 months there, we stayed at the lovely Kaleta Apartments (affiliate link), which are located within Diocletian’s Palace. Our studio apartment (called the ‘Diocletian’s Suite’) featured much character, including Roman brickwork embedded into our wall, and overhead views of Split’s Old Town streets. Owners Novica and Negri were thoughtful citizen ambassadors too. 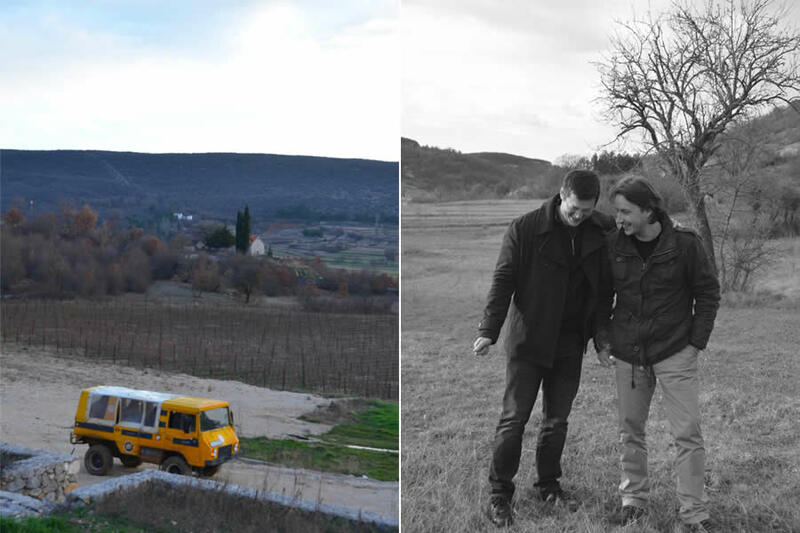 Two years later, we returned to Split, staying in the charming Varoš neighborhood, which is known for its quirky stone homes sporting hunter-green shutters and flower boxes. For those 2 months, we stayed in quaint studio apartments at the Guesthouse F (affiliate link). We especially enjoyed our tiny terrace and the kindness of our hosts, Anja and Miro. One of Guesthouse F’s apartments was originally a horseshoe maker’s workshop, which previously belonged to Anja’s grandfather. Shawn and I dubbed it the ‘horseshoe cottage’. If you’ll be staying in Split for a few days, you might be interested in the Split Card, which gives you free entry to certain museums and galleries, and reduced rates to others. Back in 2014, people staying in Split for 3 days or more could pick up the Split Card for free, but as of 2016, there is a fee to purchase the card. The link above details the current cost, as well as the participating museums and businesses. Need more trip-planning inspiration? This link contains an index of all my posts from Croatia. The Krolo family hosted us for this winery tour and lunch. Hvala / many thanks Karolina, Dražan and family for welcoming us into your home and sharing your stories, homemade food and wine. 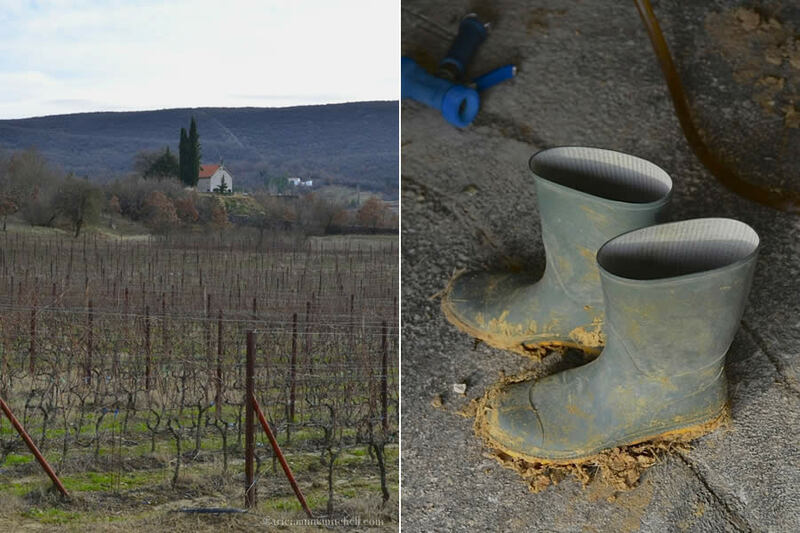 Your warm hospitality was much appreciated, and we’re delighted to have gotten a chance to experience life in the peaceful Dalmatian hinterland, if only for an afternoon! Also, thanks to Sara of Expat in Croatia for transcribing Karolina’s recipes and sharing them with me. Photography & text © Tricia A. Mitchell. All Rights Reserved. My husband, Shawn, created the video. Nice video and photo story! Many thanks for sharing the recipe, the beef pašticada looks delicious! Glad you enjoyed the piece, Indah. If the Pašticada was anywhere as good as the fish stew I had at this family’s home, it must have been fantastic. (I only eat poultry and fish, so didn’t try it.) My husband and friends gave it rave reviews though. If you give the recipe a whirl, I’d love to hear what you think. Pašticada is certainly one of the most beloved dishes in this part of Croatia. I imagine you’ve put your own little twist on the Pašticada recipe? Do you tend to marinate yours for a few days? I love that the Dalmatian cooks embrace tradition, but they’re also not afraid to put their own personal stamp on a recipe. What a glorious adventure . 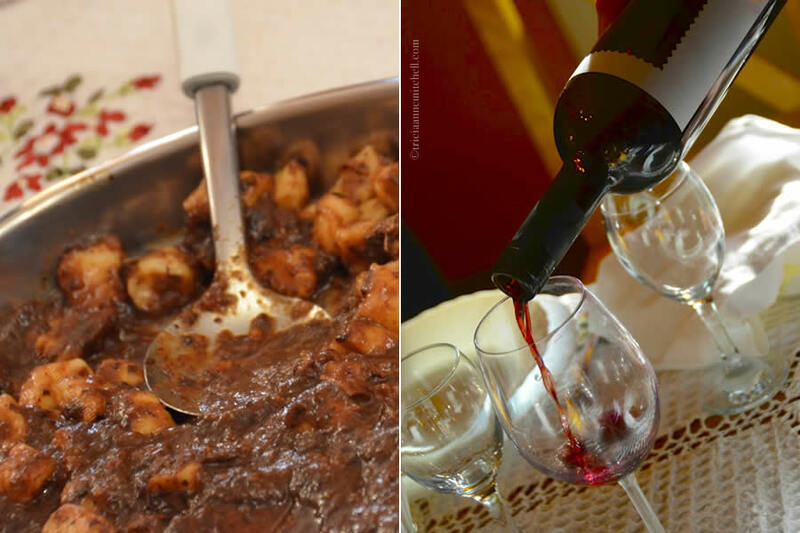 Gorgeous food and wine so beautifully photographed – it enabled one to experience another way of life. Thank you for your flattering comment – having such a welcoming hostess like Karolina made documenting the afternoon an immense pleasure. :) I think it’s lovely that they have the best of both worlds – a relaxing, country home, and one closer to Croatia’s second-largest city. Wow they are very passionate about their food and wine. Great post thanks Tricia. What a wonderful philosophy to travel through life with. I’ve never been to Croatia – – But after seeing these beautiful gastronomic delights and reading about Tricia’s wine country excursion – – Croatia is now on my radar. Greetings Cornelia, we just tried making gnocchi here in Oberammergau a few days ago and it was surprisingly easy (that was even using gluten-free flour). And since it’s Bärlauch season, we whipped up some Bärlauch Pesto to accompany pasta on another day. Do you remember your Bavarian family incorporating Bärlauch into their spring dishes? I heard that Karolina’s gnocchi was so good that I had to try making a gluten-free version at ‘home’. We dressed ours with homemade pesto using wild garlic from my parents’ neighborhood in Germany’s Alps. A lovely combination! And “positive envy” — I like that term and might have to borrow it, Randall. :) I think it speaks to blogging/storytelling’s power of inspiring and influencing in a positive fashion. Thank you for that. A great compliment with which to start the day, Randall. Know that I’m equally inspired by your work! Your essay and pictures made me feel like I was there. That was nice! In the United States zinfandel rosé is called white zinfandel. A lot of people don’t know that it is a rosé. Gerard, I always appreciate the insight you provide about American wines. It just goes to show that I need to get back more and savor some American wine. :) Hope you had a fantastic Easter weekend. We celebrated with a Croatian bottle of wine. Hi Tricia. It sounds like you had a nice Easter. I had a nice Easter too. Thank you for your You Tube video suggestion. The cheese on its own looks amazing and I’m envious that you were able to try it, not to mention all the other delicious food. I’ve never made gnocchi but with this recipe I’m tempted.